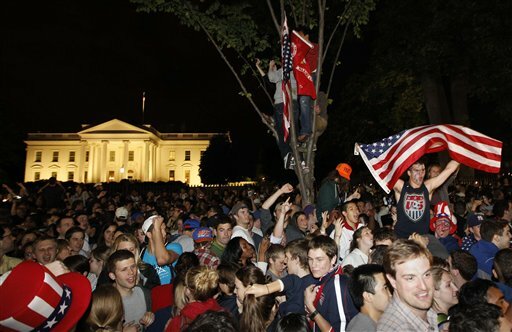 WASHINGTON – As news of the death of Osama bin Laden spread, a large crowd gathered in front of the White House to celebrate, chanting “U-S-A U-S-A” and waving American flags. After midnight Monday, the throng had filled the street in front and was spilling into Lafayette Park. People rode there on bikes and some brought dogs and took pictures. Legislative aide Will Ditto was getting ready to go to bed at his place on Capitol Hill when his mother called him with the news. Twenty-year-old Alex Washofsky came despite finals on Monday at George Washington University. He’s also a member of the Navy Reserve Officer Training Corps.